The cast gathered in Los Angeles on Saturday for the film’s premiere, which comes out in theaters on February 8. Josh Duhamel, Jason Momoa, Naya Rivera and other stars brought their kids to the red carpet for a family-friendly day of fun and movie-going. Duhamel and his 5-year-old son Axl Duhamel took photos together in superhero stances. How appropriate! Similarly, the Aquaman star smiled with his kids as he wore a beige vest, tan pants and boots. Other celebrities in attendance included Elizabeth Banks, Alison Brie, Chris Pratt, Will Arnett, Tiffany Haddish, Maya Rudolph and more. Plus, Legos both big and small made an appearance on the carpet. The Lego Movie 2 features many of the same characters and stars, including Pratt as the lead Emmet Brickowski, although he also added on the character of Rex Dangervest. Banks returns as Wyldstyle, Brie as Unikitty and Arnett as Batman, who even got his own spin-off movie in 2017. Expect to see (well, maybe hear) some familiar voices in what are bound to be hilarious “cameos”. Channing Tatum and Jonah Hill reprise their roles as Superman and Green Lantern, respectively, although Green Lantern was less than pleased to be stuck with Superman in the original Lego Movie. 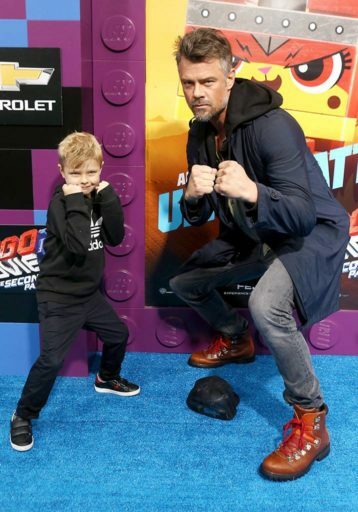 Perhaps The Lego Movie rubbed off on Duhamel’s son because the Transformers actor and his ex-wife Fergie threw Axl a superhero-themed birthday in August. Well, is everything actually still awesome for the citizens of LEGO Universe and will they bring down the bad guys once again? We’ll see, but if one thing’s certain, Batman will definitely make his presence known.